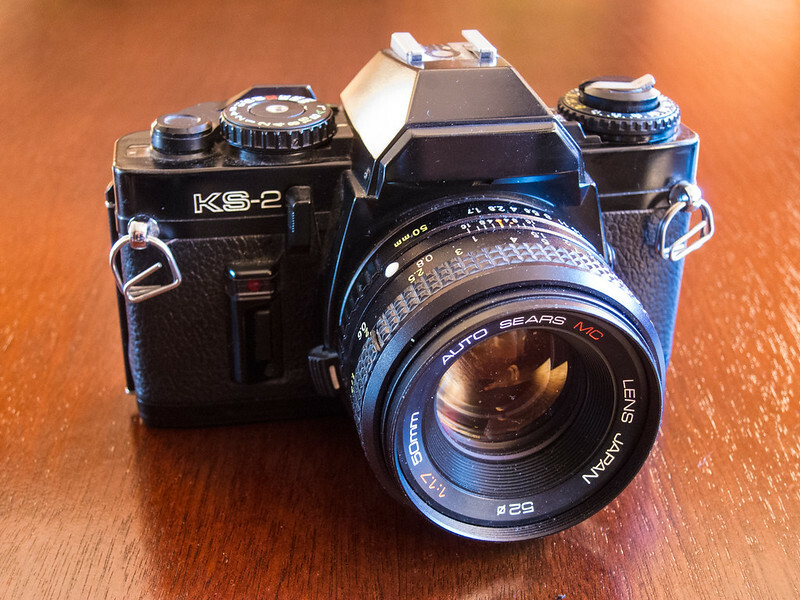 I had so much fun shooting my Sears KS Super II earlier this year that when I came upon its more fully featured brandmate, the KS-2, for a good price, I scooped it up. 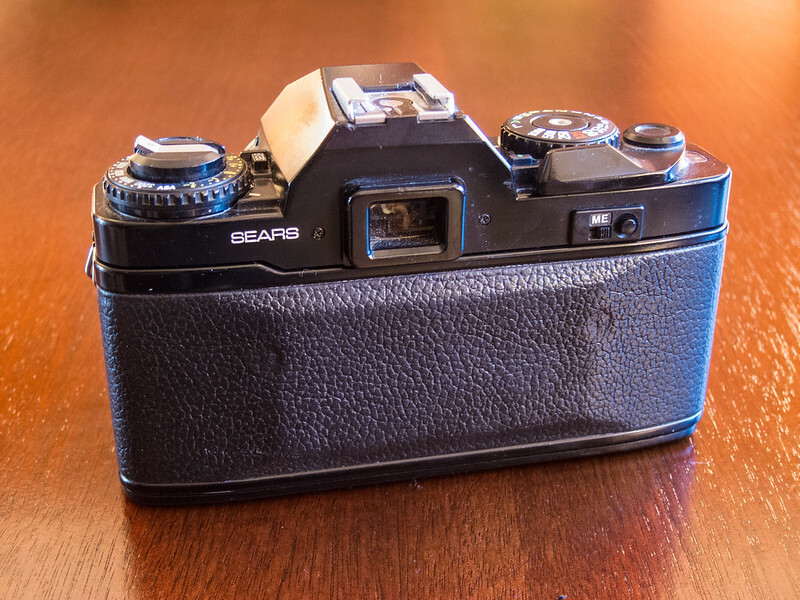 In 1982, when this camera was made, Sears was selling Ricoh SLRs as its own. This camera is the same as the Ricoh XR-7, which was then Ricoh’s top-of-the-line SLR. Where the KS Super II was limited to point, focus, and shoot, the KS-2 offers full manual control plus aperture priority autoexposure. Its shutter operates from 16 to 1/1000 second. It takes films from ISO 12 to 3200. It offers a self timer, a hot shoe, multiple exposure capability, and depth-of-field preview. And as best as I can tell, the KS-2 came in a kit with a fast 50mm f/1.4 lens. For whatever reason, my KS-2 came with the pictured 50mm f/1.7 Auto Sears MC lens. Like all Ricoh/Sears SLRs, this camera uses Pentax’s K lens mount. The KS-2 runs on two button batteries, either two silver-oxide SR-44s or two alkaline LR-44s. Without batteries, the KS-2 is inert. I loaded some Fujicolor 200 and shot about three photos when the mirror stuck up and the camera wouldn’t wind. Fortunately, the Internet knew an easy workaround: Remove the bottom plate (five screws hold it on). Inside, look for the pin I’ve circled in red. Press it in to release the winder. Keep winding until you hear the mirror return. Ta-da! Problem solved, I set about shooting. And truth be told, I wasn’t feeling very inspired. It happens. But here’s some of what I shot. At church, our parking lot is behind the building. For whatever reason, we don’t allow the alley to connect to our parking lot, so these concrete barriers block the way. Around front, here’s our sign. Washington Street, formerly US 40, formerly the National Road, is within sight of our sign. But since we’re on a residential side street, you pretty much have to live in the neighborhood to know about us. We just had all of our doors replaced. 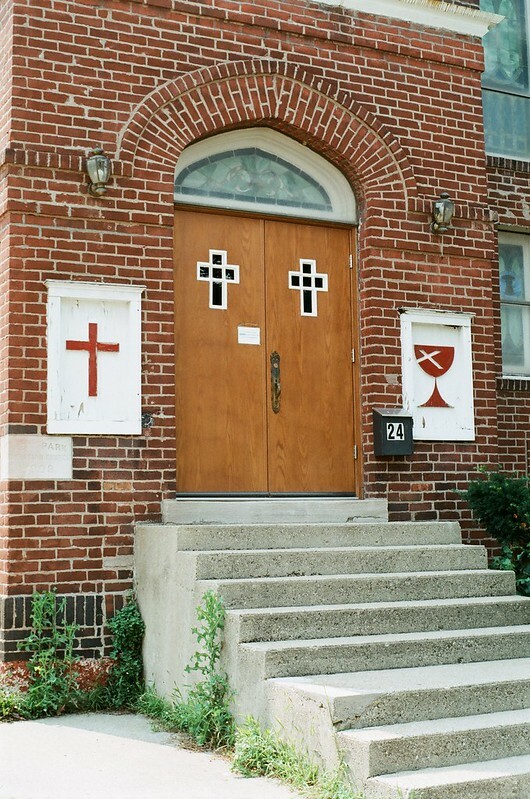 The cross-shaped windows came from our previous doors — we had them fitted into the new doors. We’re in the process of becoming an independent Christian Church, meaning the Disciples of Christ chalice symbol will eventually have to come off our building. I carried the KS-2 around with me for a couple weeks. 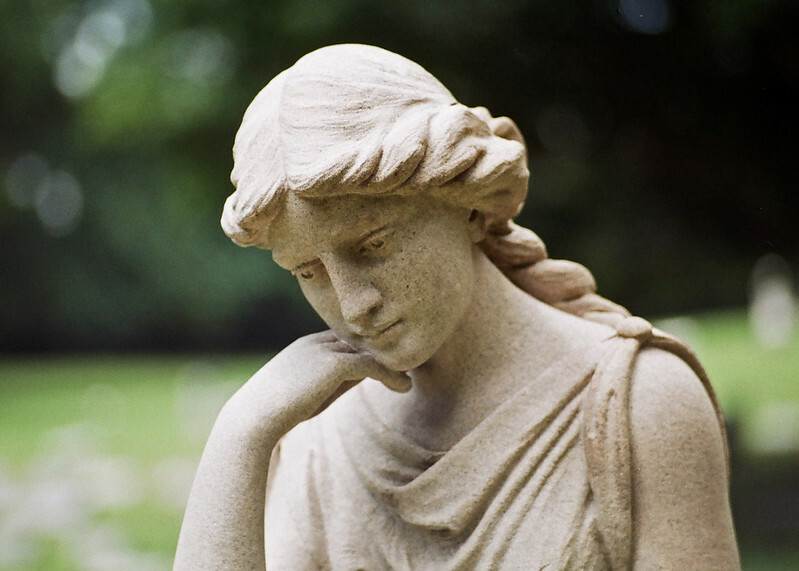 One day, my son and I went to Crown Hill Cemetery for a walk and some photographs. 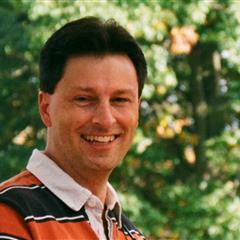 This summer, I worked part time as a consultant for a startup software company in Fishers. 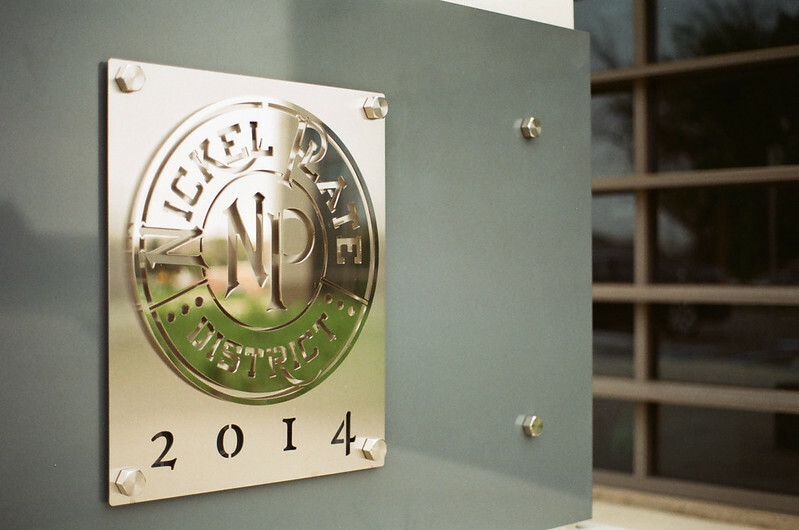 They’re in a new building in what’s known as the Nickel Plate District. Fishers is a very large suburb of Indianapolis today. But originally it was just a stop on the New York, Chicago, and St. Louis Railroad, which was nicknamed the Nickel Plate Road. The tracks through Fishers are mostly idle today, except during the Indiana State Fair each August when a shuttle train carries fairgoers to and from, and when the Indiana Transportation Museum runs one of its periodic rail tours. My sons and I took one of the tours probably a decade ago now; it was fun. Closer to home, I shot this sprinkler on the path to my front door. The subject isn’t very exciting, but the photo shows the clarity and detail this lens can capture. 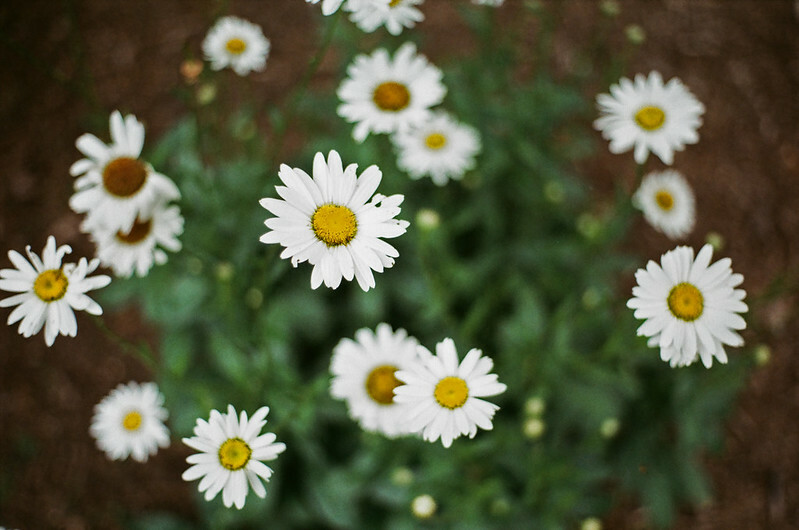 And I shot my daisies, because daisies are so darned cheerful. My KS-2 also came with a 135mm f/2.8 Auto-Sears MC lens. I clipped it on to shoot my neighbor’s ’67 Chrysler from my driveway. The spot is spoiled by a little camera shake. To see more photos from my test roll, check out my Sears KS-2 gallery. The KS-2 has but one quirk: the meter shuts off after a bit, and to turn it back on you have to press that tall button on the camera’s face. My finger always struggled to find that button when the camera was at my eye. But when the meter is active, an LED display in the viewfinder shows what shutter speed the camera selected in aperture-priority mode, or in manual mode shows up and down arrows that let you triangulate on an accurate exposure. This is a competent camera with a capable lens. A fellow could shoot it for the rest of his life and make wonderful images. That fellow won’t be me, however; I have plenty of other great gear with which I’m very comfortable. But if you want a solid SLR with good features and a good lens, the Sears KS-2 is a great choice. Do you like old cameras? Then check out all of my old gear reviews! Very nice pictures, as always. But what really intrigued me is the process and story behind a congregation disassociating itself from a formal denomination. You should write about this some time. Or maybe I’m just too much of a religion geek, if there is such a thing. Here’s a thumbnail sketch. The Disciples of Christ, the independent Christian Churches, and the Churches of Christ all come from the same root: the Restoration Movement, sometimes also called the Stone-Campbell Movement, which aimed to restore the church to resemble the one of the first century. We are anabaptists, we take communion (sometimes also called the Lord’s Supper) every week. Our worship contains five elements: singing, prayer, communion, giving, and preaching. We are a conservative branch of the faith, but within a conservative framework the Disciples are the most liberal among us, the Christian Churches tend to be moderate, and the Churches of Christ tend to be the most conservative. A hallmark of the Restoration Movement is local church autonomy. I think the Disciples have central offices, but the Christian Churches and the Churches of Christ have no organizing body, no hierarchy, no nothing. Each congregation stands on its own, depending only upon Christ. At West Park, our beliefs sometimes didn’t line up perfectly with the Disciples. But more than that, we felt like there was no benefit to being associated with the Disciples. We had been operating as an independent Christian Church for many years and we have been taking steps to own that. This is not a complicated matter: a few letters explaining our choice and we are on our way. We could probably even skip the letters; the Disciples would eventually catch on and everybody would move on. Great post and shots Jim! I’ve always liked the Sears branded cameras. In fact, I have some Sears branded telescopes too that were made by Tasco. They remind me of a different era of imports that is gone today pretty much. 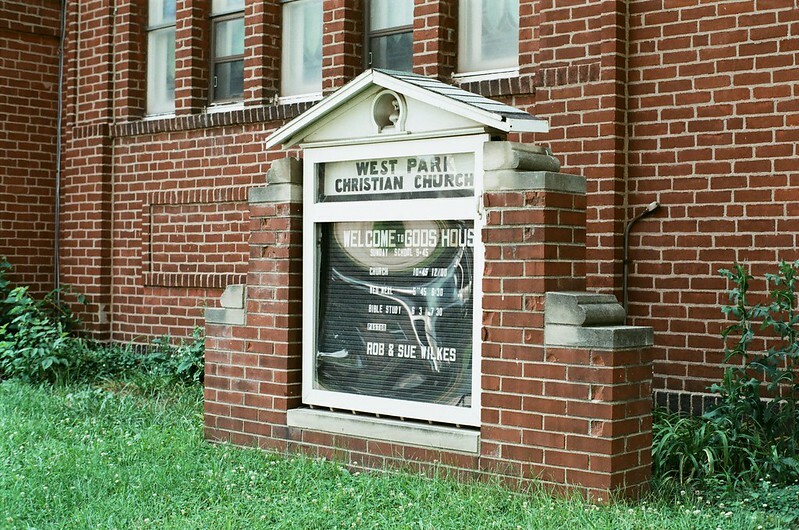 These Sears Ricoh cameras are surprisingly good. But they lack personality and inspire no love. 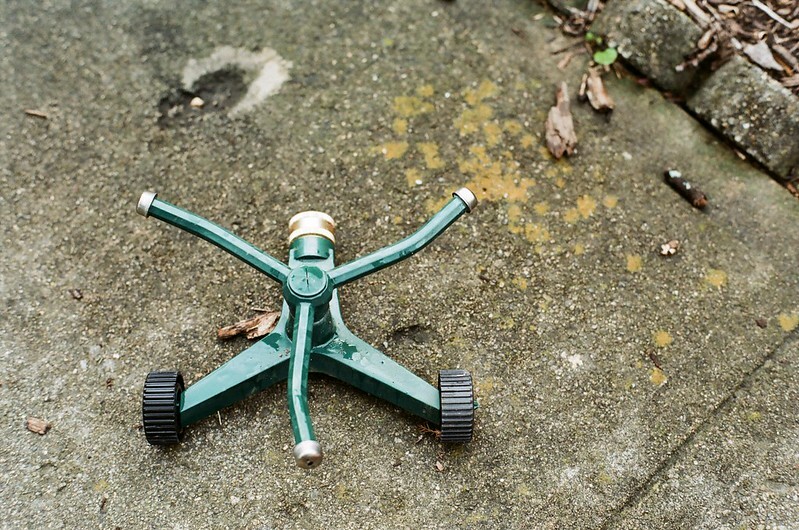 I shot my Pentax ME over the weekend and it felt so good in my hands and generated good feelings as I used it. This KS-2 is plenty competent, but generates no good feelings. Still, if you sentenced me to a lifetime of taking photos with this camera and lens, I’d just get on with it and produce solid photography. Its rather silly, but at some point I realised that I have a definite preferrence for cameras that have a silver top/bottom over the all black ones. Heh, then next week when I review an all-black Olympus OM-1, you’ll definitely prefer my older review of a silver-topped one! Thanks Sam! Yeah, I picked up this camera for $37, incl. shipping. These really do go for cheap. 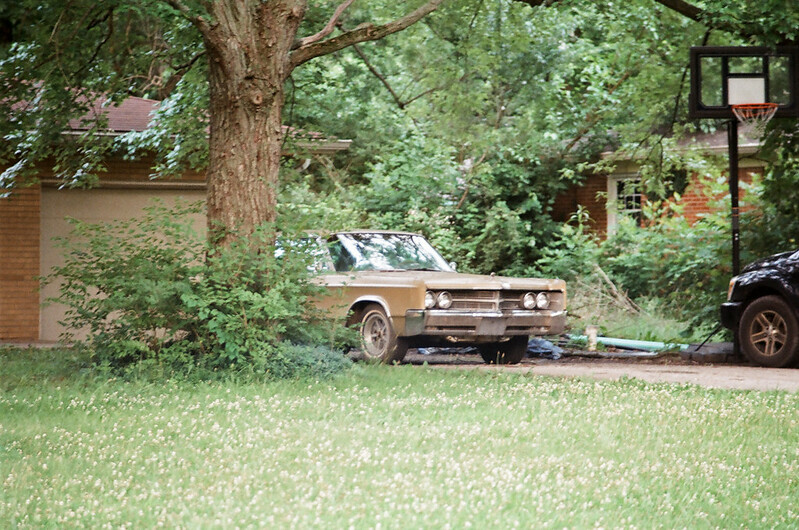 Back in the 90s I used Sears lenses on my Pentax K1000 – great combinations. 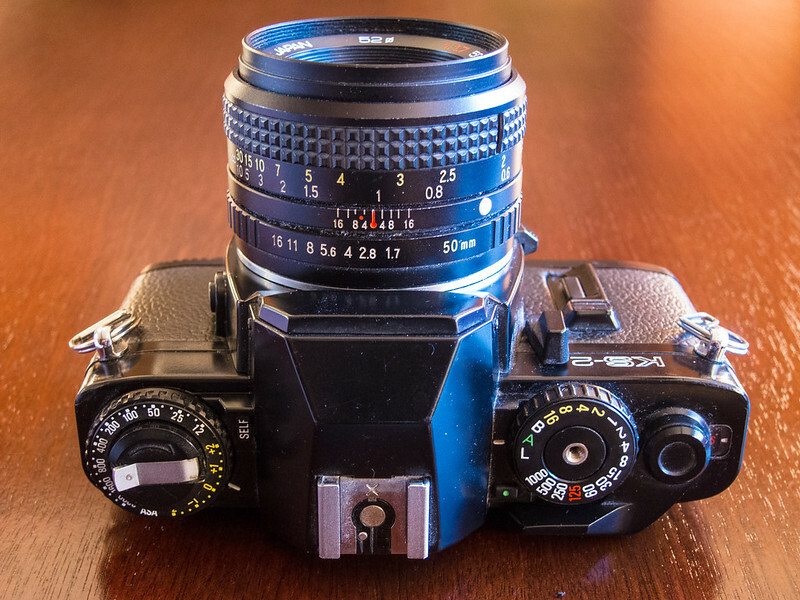 The body style of the KS-2 reminded me of my old Pentax – that was my camera for 14 years until the winding mechanism self-destructed in a cataclysmic mess. OMG, as they say now: magic. I think I’ll need that lens once every other blue moon, but I will not be parting with it. I can’t remember exactly, but I think I had a 25-85 walk-around Sears lens and a 150-500 Sears macro zoom that I never really used enough (one of those ‘I wish I had known then what I know now’ scenarios). I gave all my Sears K-mount lenses and a Pentax ZX-M to a friend of my daughter’s – she was heading for photography classes in college. No regrets on that but they definitely were good lenses – I got some great shots with them! 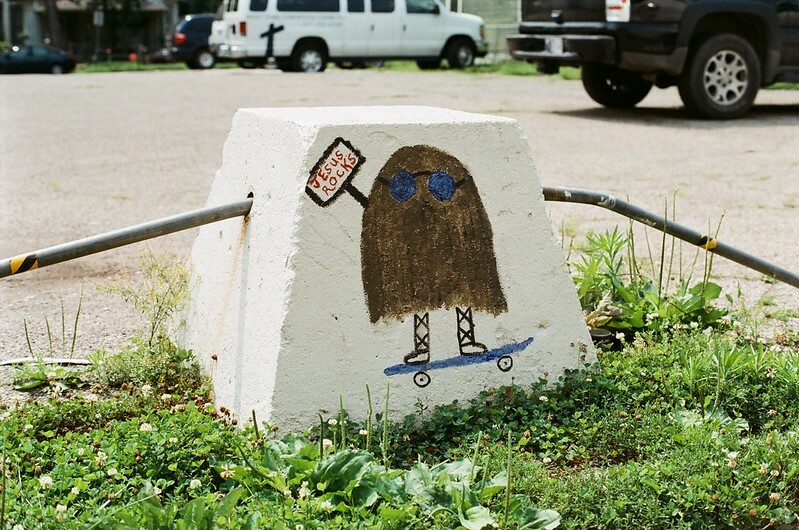 Do you have a catalog of your U.S. 40 road trip? In the menus at the top of this page, point at Above, and when the menu drops down click The National Road. Also, you can go to http://www.jimgrey.net/Roads and some long-form writing about some of my early IN/IL/OH US 40 trips are there. Just bought one of these based on your post…ten bucks plus shipping…seems to be working well so as soon as I finish some of my other in process rolls I’m excited to go! Look at you go, fixing cameras now. You are in the right path .